We are looking for volunteers who can give their time willingly and in a professional manner to promote the aims and objectives of the team. HANTSAR has members of all ages and from many walks of life. Our support team members are highly valued and help us with fundraising and events and with specialist tasks such as accounting, vehicle/general maintenance and IT support. In addition to this support members may also attend classroom training sessions and learn new skills such as navigation and first aid; they sometimes are able to help us by hiding for us during search exercises. Support members may join us at any time and will be invited to come and meet us at a classroom training session so that we can explain more about what is involved. All of our operational members are on call 24/7 and are expected to attend as many callouts as possible around existing commitments. We are particularly interested in hearing from those available during office hours. 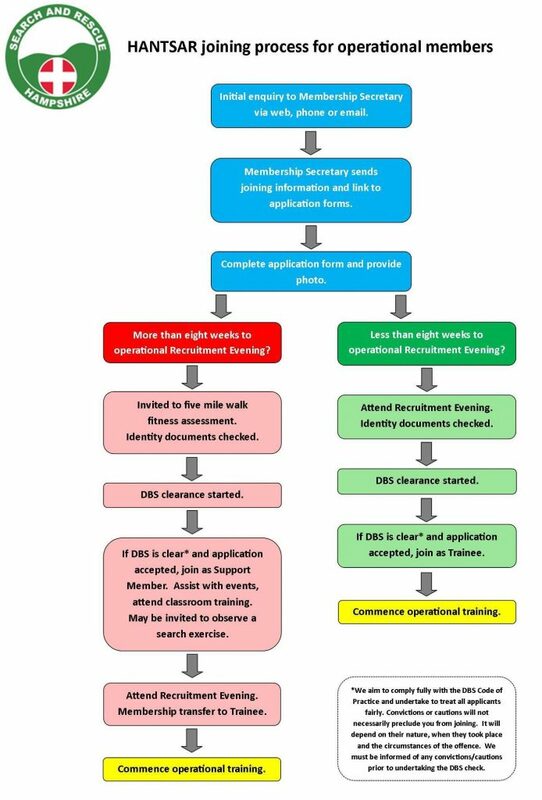 Recruitment evenings for operational members are usually held three times a year in March, July and November. However, it is possible to attend one of our fitness assessment walks and become DBS cleared and join us as a support member prior to the recruitment evening. We regularly train on three Thursday evenings and one Sunday morning a month plus very occasional Saturday sessions. All of our volunteers are subject to an Enhanced DBS check, references and periodic further police checks as required. Once operational, members are provided with uniform such as jackets but most personal kit needs to be provided by members themselves. In addition a modest yearly subscription to the team is required (currently £15 a year for operational members and £7.50 for support members). If you have any questions please contact the Membership Officer. We also have additional information here.